Longzhong new sand washing machine can be used in highway, railway, bridge, tunnel contour standard engineering, used for cleaning the ballast. It has many characteristics of multi-usage, strong processing capacity, high recovery rate of sand wash rate, saving power, easy maintenance, energy conservation, environmental protection, etc. 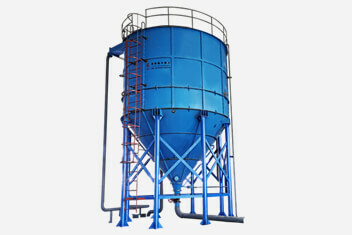 New sand washing machine is the combination of wheel sand washing machine and sand recycling machine. 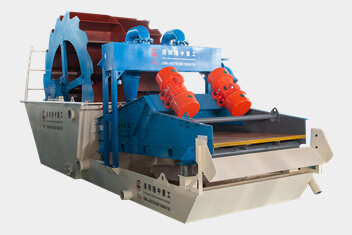 Its process is that sand and water mixture comes into the cleaning tank, is conducted by the impeller separator separation, and then comes into the lower sieve dehydration dehydration processing. Waste water overflowed from cleaning tank (including a large number of fine sand, mud, dust and other impurities), via high pressure of the vacuum pump comes into the high pressure separator. Fine sand after graded and concentrated comes into the upper sieve dehydration. The waste water, mud, dust and impurities in the cabinet, though the overflow mouth of high pressure separator comes into the high return and then are discharged. The upper produces coarse sand and the lower is fine sand, or coarse and fine sand mixed, this can be adjusted according to customers’ requirements. 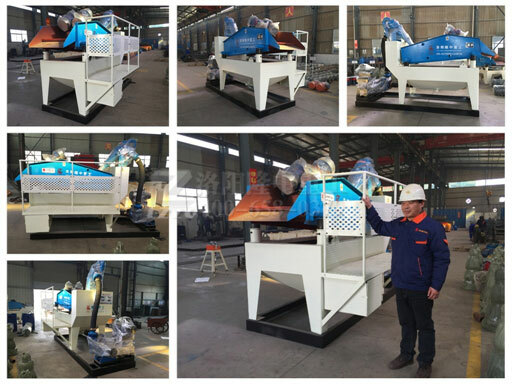 Longzhong new sand washing machine with the functions of dehydration, sand washing and sand recycling, can be used in sand washing and full recovery of fine sand at the same time, effectively reducing the impurity in the sand and gravel, mud and dust and greatly improving the quality of sand and gravel.